← Superb and surprising Australasian tasting at Fassina! Some less common (in South Australia) varietals came to my attention recently so I had to get hold of some and see what it was like. Thanks to wineries like Pertaringa our taste buds will never be doomed to monotony! A little introduction before I share my pickings! The name Pertaringa means ‘belonging to the hills’ in the Aboriginal Kaurna language. This is appropriate when you see that it is nestled in the eastern foothills of McLaren Vale, away from the main drag of the vale – and it has turned out to be one of my enduring favourites – along with d’Arenberg of course. If you only go to two wineries in McLaren Vale these are the two to pick! Both have excellent wines and very knowledgeable and friendly staff and are in pretty settings surrounded by vineyards. The experience at Pertaringa is quite different to d’Arenberg (read more about d’Arenberg wines here), being a much smaller venue and hence more personal and with some different varietals and blends. The owners of Pertaringa are Geoff Hardy – fifth generation descendant of South Australian winemaker Thomas Hardy – and Ian Leask, while Ian’s son Richard manages the vineyards. Geoff has a strong winemaking and viticulture background, joining the family business as a teenager, and over the years making an enormous contribution to research into clonal variation and supplying many growers with vine planting material. Ian previously ran vineyards in the Hunter Valley, including Tyrell’s, Rothbury Estate and the Pokolbin Vineyards for J.Y. Tulloch and Sons. He ran Ryecroft in McLaren Vale for several years before he and Geoff purchased the 32 hectare vineyard in 1980 to start Pertaringa. Winemaker and brand ambassador for Pertaringa is Shane Harris who made these two wines just released. Pertaringa has the traditional McLaren Vale varieties of grenache and shiraz and others you might expect, including cabernet sauvignon, merlot, sauvignon blanc and semillon and even has a trendy moscato. My interest was heightened when I saw that they had released two unusual red varietals – the French tannat and Italian aglianico, both grapes with a long history in Europe where they originate. 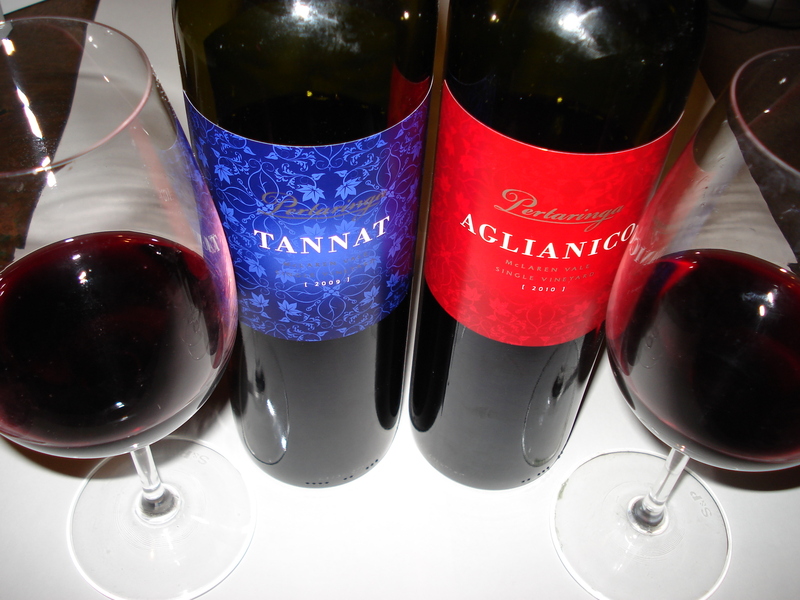 Pertaringa 2009 tannat and 2010 aglianico: the elegant floral yet minimal labels reflect the class of the wines within. Originating in Greece, this black grape variety was introduced to Basilicata and Campania in southern Italy over 2,000 years ago. It is used to make Basilicata’s only DOC* wine – Aglianico del Vulture – from vineyards around the extinct volcano Mount Vulture (not the scary flying version). In Campania the notable wine is Aglianico del Taurasi, a DOCG** wine. It can also be blended with cabernet sauvignon and merlot to produce some Indicazione Geografica Tipica (IGT) wines (see Tig’s Tuscan article for more on these Italian classifications…). The typical characteristics are of firms tannins, high levels of acidity and concentrated fruit, so this already puts its hand up as a wine likely to age well. So to Pertaringa’s single vineyard 2010 aglianico – well what a refreshing and vibrant way to enliven your passion for wine (not that mine was flagging…). This ruby/cherry red wine gives raspberry, red plum and cherry fruit aromas with some alluring spice and hints of licorice and chocolate. These flavours follow through to the palate, bursting with these fruit flavours, mouth-watering and juicy, with a touch of sweet fruit and a gentle peppery tinge. The lovely mouth feel of this medium bodied yet generous wine has a long loong looong savoury finish! The palindromic tannat hints at its qualities in the name – derived from the Latin for tannin – and these wines tend to be powerful with high alcohol levels. This late ripening variety is suited to warmer growing regions such as McLaren Vale and the south-west of France, from where it originates. In France, tannat is associated mostly with the appellation of Madiran and is often blended with cabernet sauvignon, cabernet franc or fer (also known as fer servadou, pinenc or mansois). The wines are usually aged in oak for 20 months or more to allow the tannins to soften. Tannat is also known as national grape of Uruguay, known as harriague, where the wines are made to be a bit softer and lighter in body. It is common to see tannat blended with pinot noir or merlot. It is also grown in other parts of Australia, Argentina, Italy, US and Brazil. Tannat has a reputation for being especially good for heart health, containing high levels of procyanidins which are antioxidant and also help repair cells of the coronary arteries. For example, it is recommended for its health properties by Roger Corder in his book The Red Wine Diet. So to Pertaringa’s 2009 tannat – this wine is deep, dark and brooding. In the glass it is dark purple, like black cherry juice. I decanted the wine and gave it time to open up and was rewarded with an equally deep and brooding nose of blueberry, blackberry and very dark chocolate, accompanied by earthy yet floral aromatics, with an occasional hint of toasty vanilla. Typical flavours associated with the French tannats are of raspberry and the Uruguayans of blackberry, while the Uruguayan tannats tend to be lighter bodied and lower in tannins, so my amateur conclusion is that Pertaringa’s sits between the two! This is a full bodied wine by anyone’s standards, savoury and with lip-smacking acid and grainy tannins. The earthy juicy fruit flavours fill the mouth and as it was open longer, I got more chocolate, a hint of vanilla and gentle toasted notes, slowing giving way to the long savoury finish. No doubt about it this wine will age very well – up to ten years say Pertaringa. This will be a treat worth watching develop over the years. Tannat is also known as tanat, moustrou, moustroun, bordeleza belcha and harriague. Synonyms for aglianico include: aglianicone, aglianicuccia, agnanico, cascavoglia, cerasole, ellanico, ellenico, fiano rosso, gagliano, gnanica, prie blanc, ruopolo, spriema, tringarulo, uva catellaneta, uva nera and more! This entry was posted in McLaren Vale wine, New World wine, South Australian wine, Wine varietals and blends and tagged aglianico, Australian wine, d'Arenberg, McLaren Vale, Pertaringa, South Australian wine, tannat, Wine. Bookmark the permalink. Thank you so much – I enjoyed it! We grow the Aglianico grape at Cougar Vineyard & Winery in Temecula, CA and our 2008 Estate Aglianico is 100% varietal. Consumers are delighted with this wine. Hi Joe, Thanks for your comment. That’s good to know. I’ll pass it on to Pertaringa too. Best wishes, Nicola.